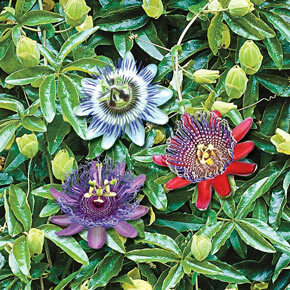 Hardiest of the gorgeous and intricate passion flowers! Complex, 4" flowers keep coming all summer and don't stop until the first frost. This vigorous vine will grow stems to 30', covering a 10' stretch of fence, or a nice-sized trellis. Can be grown in the ground or in a large container, which can be brought indoors to a cool sunny place to overwinter north of zone 6. Prune 1/2 the stems hard in early summer, and tip prune the rest. Flowers best in well-drained, gritty soil that's not too fertile. 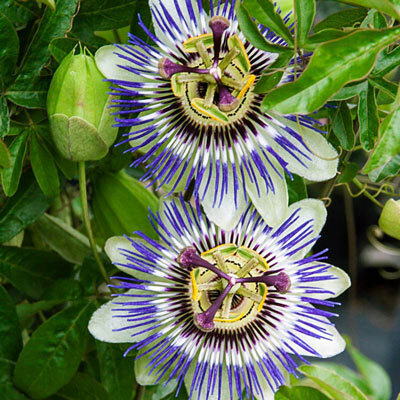 Passiflora caerulea. Full Sun. Winter Care: In climates where temperatures drop well below freezing, trim back hard and bring inside for winter months. Treat as a house plant. Flower Form: Spider-like exotic flowers. 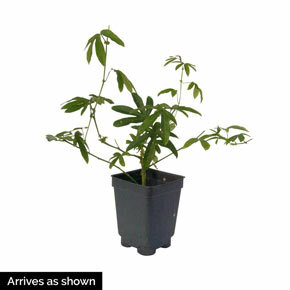 Foliage Type: Large 5 lobed leaves that are immune to insects. Resistance: Good resistance to all pest and disease problems. Pruning: To restrict growth as needed. Any time. Soil Requirement: Well drained, humus enriched. Additional Information: The pulp of the fruit may be steeped in a tea that is said to relieve stress.